I just purchased a HiDPI monitor and though I've been able to fix the bulk of problems following the Arch HiDPI guide, there are still many problems to fix and I can't identify some of the desktop elements so I can theme them properly. I've been using the program GTKInspector to find css elements in various GTK apps so I can edit the theme, but I can't figure out how to do the same for for my xfce desktop. 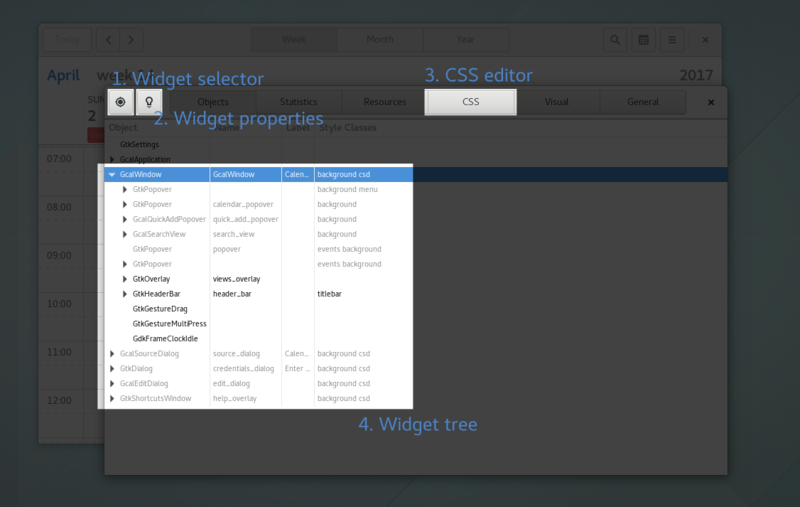 In GTKInspector you can drag a cross-hair (Widget Selector) over an element in a program and you can then see the GTK tree, along with the css elements so you can know what the element is called and hence you can override it in a custom gtk.css file. I've tried launching xfce4-panel with debugging enabled, (Which is how you enable GTKInspector for a program) but it just won't work for xfce4-panel itself. Is there a way to use GTKInspector on xfce4-panel, or another tool that would identify the existing theming elements? For example, I'd like to make the icons larger in the windows list. Browse other questions tagged xfce gtk theme gtk3 or ask your own question. Where may I find a reference scheme for GNOME 3 theming (e.g. Adwaita)?